I’ve just completed a wonderful Frost Flower Wrap as a Christmas gift for my mom! 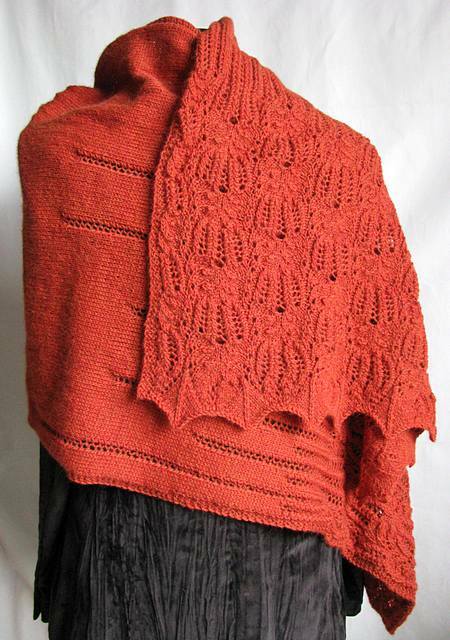 For the last couple of weeks I have been so busy with my job, kids, attending middle school open houses with my oldest son, lots of knitting submission deadlines, tech editing, swatching, pattern & article writing plus all the holiday busyness that this shawl truly represents a little miracle. Knit every day a little bit and you will be surprised by how much can be accomplished – and how quickly too! I knit during my kids’ soccer practices, while waiting in the car for them to get out of school, during car trips for running errands where I was the passenger, during visits with friends, during an oil change, during short work breaks and before going to bed instead of reading a book. The minutes and rows will add up quickly, I am telling you. 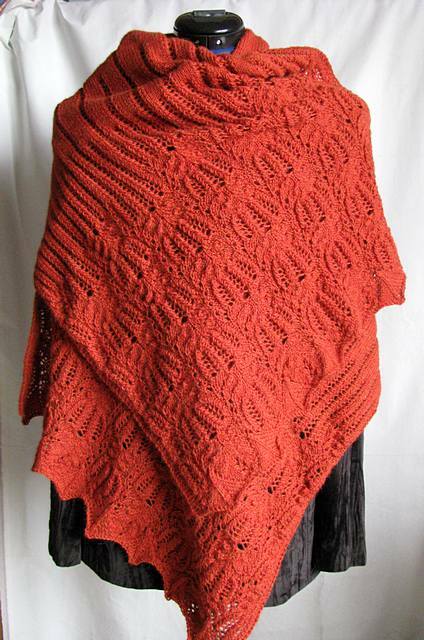 I did make one time concession though: It’s not my own pattern but one that I happened to have bumped into a while back on Ravelry when I was doing some research for some other design ideas. I did make it a bit wider than the original pattern called for and adjusted the length of the Frost Flower lace edging accordingly so that the proportions looked right. For a few more details visit my Ravelry project page. 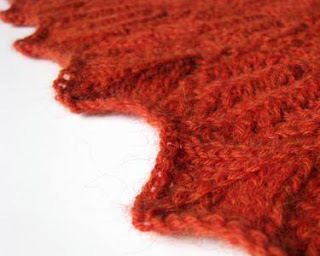 The yarn I chose for this project was purchased online at DBNY (Discontinued Brand Name Yarns). 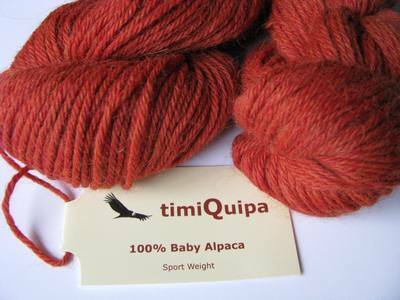 It is a super soft, 100% baby alpaca, sport weight yarn by timiQuipa. And the color “Rust” is so deep and rich – perfect for the grayer time of the year. Big “Thank You” to the folks at DBNY to take the extra time and effort to match dye lots when I decided to make a wrap instead of a scarf and ordered more of this yarn a couple of weeks after my initial first order. And I have still 2 skeins left over for perhaps some fingerless mittens? Post office, here I come! Ready to stand in line… now, where is that other knitting project I still need to finish…?